I write in response to an appeal by Mr Themba Maseko who, during his testimony last week, called on South Africans to come forward with information about “state capture.” Although I am not a government official, you will recognise my name as the applicant whose case before the Constitutional Court forced President Jacob Zuma’s reluctant appointment of the Seriti Commission of Inquiry. President Zuma reportedly told the ANC’s national executive committee (NEC) that he was going to lose the case I had brought against him and, therefore, he would appoint a commission of inquiry to avoid being dictated to by the Constitutional Court. I was appointed by Archbishop Njongonkulu Ndungane to represent the Anglican Church during the 1996-1998 defence review conducted in Parliament. Notwithstanding 20 years of heavy-handed cover-ups, the arms deal scandal is still recognised as having unleashed the culture of corruption that afflicts our country. The arms deal itself was however, merely the “tip of the iceberg” involving a wide range of scams, including money laundering. The common denominator of these scams was kick-backs to the ANC in return for political protection. In his book After The Party, the former ANC MP Andrew Feinstein describes how Finance Minister Trevor Manuel pressured him to drop the SCOPA investigation into the arms deal. Feinstein also relates how a senior member of the NEC informed him that funding from arms deal companies enabled the ANC to fund the 1999 elections. In addition, 160 pages of affidavits in my possession from the British Serious Fraud Office and the “Scorpions” detail how and why BAE laundered bribes of £115 million (R2.1 billion) to secure its arms deal contracts, to whom the bribes were paid, and which bank accounts in South Africa and overseas were credited. These affidavits were submitted to the North Gauteng High Court in November 2008 as part of an application for authority to raid BAE’s premises in Pretoria and the Western Cape. As a result of those raids, 460 boxes and 4.7 million computer pages of evidence were seized. In addition, the Scorpions held evidence against the German Frigate Consortium (GFC) and German Submarine Consortium (GSC). 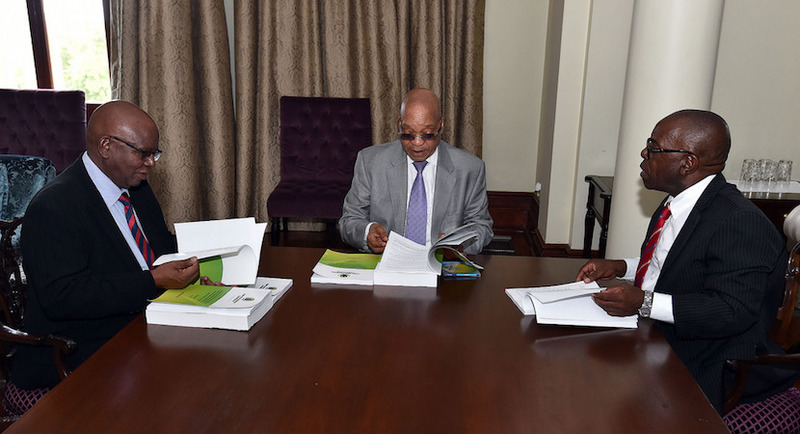 The basis of my application to the Constitutional Court in 2010 was that, given this huge volume of evidence, it was irrational and therefore unconstitutional for President Zuma to refuse to appoint a commission of inquiry to investigate the arms deal. His legal counsel was unable to rebut the evidence, hence President Zuma’s appointment of the Seriti Commission. Nonetheless, all this evidence was left in two shipping containers in Pretoria, un-investigated by the Seriti Commission. The Commission pleaded it would be too expensive (estimated at about R250,000) to index the documentation. Instead, the Commission spent R137 million of public money, and wasted five years on a further cover-up of the arms deal scandal. In their attempts to cover-up the scandal, the Mbeki, Motlanthe and Zuma presidencies engaged in destruction of constitutionally enshrined checks-and-balances. Parliament became a rubber stamp, and various other structures including the National Prosecution Authority were gutted in a forerunner of what we now term “state capture.” The systematic and deliberate destruction of those constitutional checks-and-balances thus facilitated the “state capture” by the Gupta brothers. The Auditor General reported to Parliament in 2000 that he was concerned about the undue preference given to BAE, including that purported offset benefits could not be guaranteed. When Parliamentarians and the Auditor General demanded details of the offset contracts, they were blocked by officials of the Department of Trade and Industry with spurious excuses that the contracts were “commercially confidential.” The resultant Joint Investigation Team report in 2001 was immediately dismissed as a whitewash. The Seriti Commission proved a complete farce, highlighted when Mr Norman Moabi in January 2013 revealed that Judge Seriti was pursuing “a second agenda to silence the Terry Crawford-Brownes of this world.” Judge Francis Legodi, Advocate Tayob Aboobaker and several other senior members of the Commission subsequently resigned, purportedly also because of dissatisfaction with Judge Seriti’s conduct. The arms deal was predicated upon the absurdity that R30 billion spent on armaments would generate R110 billion in offsets and create 65,000 jobs. Section 217 (1) of the Constitution requires that government procurements must be conducted in accordance with “a system which is fair, equitable, transparent, competitive and cost-effective.” Because of its importance, this obligation is also incorporated into the Public Finance Management Act (PFMA) and Treasury regulations. Advocate Aboobaker resigned shortly thereafter. Predictably, the offsets did not materialise. The Debevoise & Plimpton report in connection with the submarine and frigate contracts confirmed that offsets were simply vehicles to pay bribes and found that the German Submarine Consortium and German Frigate Consortium met only 2.4% of their offset obligations. Consequential from release of that Debevoise & Plimpton report, the Minister of Trade and Industry in 2012 acknowledged in Parliament that his department had grossly inflated the offset figures in reports to Parliament. [i] He thus confirmed the veracity of the report. His department subsequently pleaded that it lacked the capacity to audit and enforce the arms deal offset obligations. Similarly, BAE/Saab met only 2.8% of their NIP obligations of $7.2 billion. At the present exchange rate of R14.5 per $1, those BAE/Saab NIP offset obligations would be equivalent to R104 billion. BAE/Saab were also obligated to deliver an additional $1.5 billion (R21 billion) in DIP offset obligations. In present values, the German offset obligations were approximately R107 billion which also failed to materialise. Judge Seriti blocked submission of the Debevoise & Plimpton report as evidence. Other findings in the report were that the roles of Mr Tony Georgiadis (and others) were to influence President Nelson Mandela and [then] Deputy President Thabo Mbeki to purchase German warships. Under cross-examination by my legal counsel Advocate Paul Hoffman, President Mbeki admitted in July 2014 that Georgiadis was a donor to the ANC. On the rationale for the package, the Commission found that it was necessary for the SANDF to acquire the equipment it procured in order to carry out its constitutional mandate and international obligations of peace support and peace-keeping. On the question of whether the arms and equipment acquired are under-utilised or not utilised at all, the Commission found that all the arms and equipment are well-utilised. On whether the job opportunities anticipated from the package have materialised, the evidence tendered before the Commission indicated that the projected number of jobs to be created through the arms procurement process was achieved. On whether any person or persons improperly influenced the award or conclusion of any of the contracts in the procurement process, the Commission found that the evidence presented before it does not suggest that undue or improper influence played any role in the selection of the preferred bidders, which ultimately entered into contracts with the government. In terms of the subpoena served upon me to testify before the Commission, I was invited to examine documentation. Accordingly, I requested the International Offers Negotiating Team (IONT) and Financial Working Group papers but was repeatedly blocked by Judge Seriti from examining them. The Cape High Court in March 2003 awarded me discovery of those documents. Despite the Court’s rejection of their argument that it was not in the national interest to disclose how the government conducts its international financial arrangements, Minister Trevor Manuel and Ms Maria Ramos (then Director General of the Treasury) refused to comply with the discovery order. In June 1998 Manuel and Ramos had jointly signed a Treasury memorandum entitled “Availability of Funding for Procurement of Defence Equipment,” which declared funding for defence procurements should not exceed R1.4 billion by the 2001/2002 financial year. AjayGupta is a fugitive from justice. There is a warrant of arrest for him. It would be wrong to allow him to testify from Dubai. If he wants to participate in #StateCaptureInqiuiry, he must do so in South Africa. Like all fugitives from the law, he faces risk of arrest. I estimate that the documents amount to about 17,000 pages and were distilled into the 57 page affordability study submitted to the Cabinet in August 1999. The study enumerated the numerous risks of the arms deal, especially the foreign exchange risks, which it predicted could lead the government into mounting fiscal, economic and financial difficulties. The arms deal was costed at R6.25 per $1. The rand has a long history of depreciation, and mismanagement by the SA Reserve Bank. The exchange rate is presently R14.5 per $1, hence South Africa’s financial difficulties including investment downgrading to “junk” status. The study also noted that offsets could not be guaranteed. The cabinet overruled these warnings because it naively argued the offset benefits would outweigh those risks. Offsets are internationally notorious for corruption, and for not materialising. They are a ploy promoted by arms companies in collusion of corrupt politicians to fleece the taxpayers of both supplier and recipient countries. My submission to the Seriti Commission in June 2012 focused upon offsets and thus the entire arms deal failing the constitutional obligations of section 217 (1). That submission was ignored, as were my subsequent references to the Commission’s obligations to comply with sections 2 and 237. Appended with the submission were a legal opinion by Advocate Geoff Budlender, and the 20 year Barclays Bank/Export Credit Guarantee Department loan agreement signed by Trevor Manuel in respect of the BAE Hawk and BAE/Saab Gripen fighter aircraft. The loan agreement was verified as authentic in 2003 in the Cape High Court by Advocate Michael Kuper, who was representing the Minister of Finance. Kuper also emphasized that their default clauses were “potentially catastrophic for South Africa.” This agreement runs until 2020 and, in my opinion as a former international banker, is a textbook example of “third world” debt entrapment by European banks and governments. Number of people in prison? There was no authority from Parliament for the arms deal acquisitions. Given South Africa’s straightened financial circumstances, Modise and the cabinet sub-committee led by Mbeki embarked on a campaign of deception regarding offset benefits. In addition, Manuel grossly exceeded his borrowing authorities in terms both of the erstwhile Exchequer Act and the PFMA. Accordingly, Kuper requested the Court to impound the loan agreements because of their extreme sensitivity. Instead, and as explained above, the Court awarded me discovery of the IONT and Financial Working Group papers. The documents are therefore are not “privileged,” whatever the role of National Treasury in falsely misinforming the Commission. The people of South Africa, I regret, were the victims of a massive fraud perpetrated by foreign arms companies and governments. You will of course be aware of Lord Denning’s famous dictum “fraud unravels everything,” but also that there is no prescription on fraud. In his legal opinion, Budlender also cited the principle that the fraudster should not be allowed to financially benefit from his fraud. May I submit that release to me and/or the State Capture Commission of Inquiry of the estimated 17,000 pages of the IONT and Financial Working Group papers held by National Treasury will enable our government both to cancel the arms deal contracts and to claim very substantial financial damages from the British, Swedish and German governments? Not only were these governments complicit in the fraud, but they also guaranteed the contracts and financing arrangements. [i] Ivor Powell, 2012, May 15. “Davies Admits Dodgy Arms Deal Offsets,” The Star. [ii] President Jacob Zuma’s press statement on the Arms Procurement Commission report, April 21, 2016. [iv] Business Day, 1998, November 19.